The basic Center of Excellence concept and model --- what it really is, how it's structured, and how it's supposed to work. The two types of Sales Ops Center of Excellence we found --- what makes them different and why it matters. 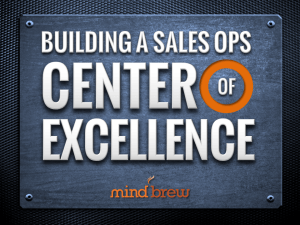 A straightforward, seven-step process for creating and developing your own Sales Ops Center of Excellence. The most-important decision you need to make around the primary mission of your Sales Ops Center of Excellence. Are They a Price Buyer or a Poker Player? In this expert interview with Nelson Hyde of Holden Advisors, you will learn how to tell the difference between true price buyers and buyers who are bluffing.